Playing with our voice is one of the most entertaining things that can be done and Funny Voice is a program that will allow us to do so. 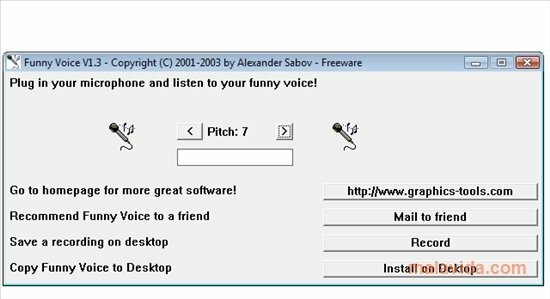 This software modifies the microphone input by modulating the sound and changing the pitch values so as to make the voice sounds deep or high-pitched. Funny Voice is very simple, it has various pitch presets that the user has to choose to be able to vary the voice between that of a child or a Smurf all the way up to very deep and loud voices. What's more, the application offers us the possibility to record everything that we do by simply activating an option, even though we will have to be very careful while doing so, because the sound may mix and produce irritating noises. The program is really rather basic, and the audio files that it generates are recorded in WAV format, nevertheless, if what we want to do is to change our tone and pitch of voice to record them the program will perform this task perfectly. Don't let other people tell you what it's like! Download Funny Voice and have a good time changing your voice however you like.